Session 9 is a 2001 American independent psychological horror film directed by Brad Anderson and written by Anderson and Stephen Gevedon. The film takes place in and around the Danvers State Mental Hospital in Danvers, Massachusetts, which was partially demolished five years after the film was made. Kirkbride Mental Health Hospital, built in 1871 is being reclaimed as a town hall and renovated after being closed down nearly fifteen years earlier in 1985. 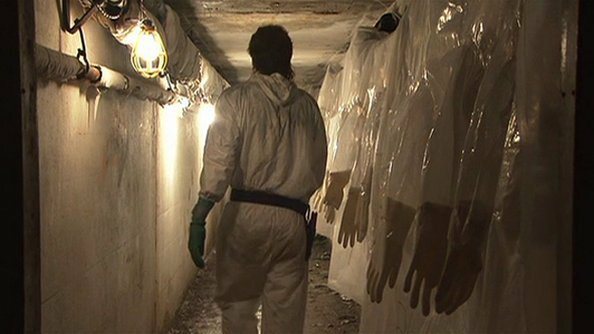 Hazmat Elimination Company, an asbestos removal company run by Gordon Fleming (played by Peter Mullan) and his associate Phil (played by David Carusoe), are the first to start on the renovation of the building. The film opens with a lightly humoured tour through the asylum led by Bill Griggs (a cameo by Paul Guilfoyle) as Gordon and Phil get their first glimpse of the aforementioned mad house. Distracted by ghastly rooms and one hallway in particular, Gordon hears a voice call out to him but is snapped back to reality by partner Phil. After the heebie-jeebies have been established cut to a scene of Gordon sitting alone in his truck as he fawns over pictures of his newborn and watches her and his wife as they play out front of their home. This scene is cut short by terrible screams and a haunting feeling that perhaps all is not well in the Fleming household. Now cue Gordon’s employees: Hank (played by Josh Lucas), Gordon’s nephew Jeff (Brandon Sexton III), and Mike (Stephen Gevedon) a former lawschool student whose father was the district attorney who indirectly led to the closing of Kirkbride through a patient’s lawsuit in 1984. As the film glides along with horror stories of old, employee banter, and Gordon’s increasingly distant behaviour, Mike finds some old recorded sessions (labeled 1-9) in an office while checking a generator and Hank stumbles upon coins from the 1800’s in another part of the building. Mike begins stealing time away from the job to sneak downstairs and listen to the recorded sessions which are centered around patient #444 Mary Hobbes, a patient with multiple personalities. As the week continues Gordon becomes more irritable, Mike continues deeper into the sessions and Hank heads back late at night, for the silver dollar payload, and mysteriously disappears. After Hank’s disappearance the rest of the crew becomes more and more edgy as the week continues. Gordon’s history with his distant wife comes to light, Phil’s anger and impatience with Gordon becomes a factor and all the while Mike gets closer and closer to the end of the sessions with Mary Hobbes. You begin to see the number 444 show more often in the film on rooms and tombstones, and Gordon reveals to Phil that he hit his wife by accident that night after their tour of the asylum. Phil goes to Mike with this news recommending that Gordon could use some time off, all the while unbeknownst to them Gordon listens from around the corner. Just then Hank is found wandering the halls by Jeff. As Jeff runs to tell the others Hank disappears again and the manhunt is on. With flaring tension between Phil and Gordon, Mike and Jeff swimming in a sea of apprehensive paranoia and the manhunt for the missing Hank, the story reaches its climax with a shot of each character alone against an unseen villain. What is really going on here? Is there something supernatural at work or is it simply someone driven to madness? Session 9 has atmosphere in spades, as the tension levels rise throughout the film you feel an uneasiness grow inside you that takes a long while to dissipate even after the movie has drawn to a close. Combined with the relatability of Gordon’s situation (what parent hasn’t felt the maddening grip of sleep deprivation) and the eerie intrigue of Mary Hobbes’ recordings, it all makes for a well put together psychological horror experience. If I had to choose one specific part of the film that stands out, I’d have to pick Peter Mullan’s performance as Gordon. He manages to play a desperate man on the edge that you also root for and want to see finish the job so he can go home to his new family. Despite all you learn though about what really happened, I still feel extremely sorry for him and can sympathise that it was a culmination of chemicals, exhaustion, isolation and perhaps existing mental illness. I’ve read that there are two ways to take this film, but without spoilers I’ll just say that I in no way think this film has supernatural elements and I think if it did then it would ruin the story for me.